Legendary UCLA basketball coach John Wooden is known for his record-breaking run of NCAA championships and for working with some of the best players in the sport. His principles for success have been used by not only coaches and athletes, but also business leaders, entrepreneurs, and others. But his reach stretches even farther than most people know–into the hearts and lives of the people who learned the game of basketball on one of Coach Wooden’s forgotten teams. For nearly twenty years, John Wooden ran scores of summer youth basketball camps in California and other states, imparting wisdom and teaching skills to thousands of boys and girls between the ages of eight and fifteen. Most would not grow up to play professional or even college ball, but all of them found their lives changed by their interaction with the greatest coach who ever lived. In those camps, Coach Wooden also impacted hundreds of camp counselors and assistant coaches. This one-of-a-kind new book shares their inspiring stories and six fundamental lessons for a life of success and an unforgettable impact on others. 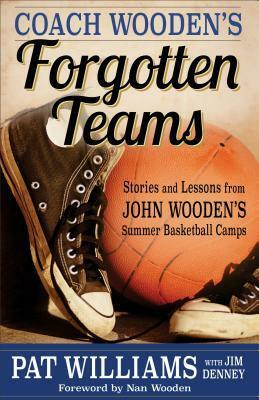 Learn more about Coach Wooden’s Forgotten Teams.